Wedding Contest-30% off Wedding Flowers! A simple and elegant vase of roses. Bonavista Flowers, your trusted local florist in Calgary, offers professionally designed flower arrangements and floral gifts to fit any occasion. We can help you find the perfect flowers and deliver them throughout Calgary and the surrounding area. Our network of trusted florists even offer floral delivery nationwide! Need to send a last-minute gift? Don’t worry! 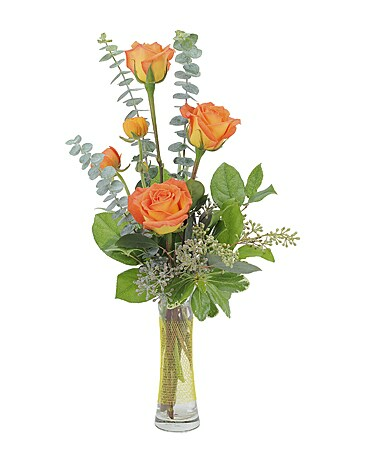 Bonavista Flowers offers same-day flower delivery throughout Calgary. Give a gift that will bring a smile to a loved one’s face with fresh flower bouquets from Bonavista Flowers. In need of a gift for a holiday or special occasion? Find gorgeous arrangements of birthday, get well, or anniversary flowers. Our Valentine’s Day flowers and Mother’s Day flowers are guaranteed to please, while our sympathy flowers will show them how much you care. With our reliable service, you can count on Bonavista Flowers for high quality floral gifts delivered throughout Calgary, AB. You can rely on Bonavista Flowers for the best floral gifts in Calgary! Browse our website and shop our collection of fresh flower arrangements and customized gift baskets. Choose from a variety of options! When you find the perfect gift, you can easily order online or call us directly. No matter what your taste or budget, you can trust Bonavista Flowers to deliver beautiful flowers to friends and family in Calgary or across the country. As a top flower shop in Calgary, Bonavista Flowers has an assortment of lovely plants and dazzling gift baskets for any occasion. Our expert florists can create the perfect custom bouquet to meet your needs and will hand-deliver each gift right to your recipient’s front door. If you’re looking to impress with fresh flowers in Calgary, AB, Bonavista Flowers is the right florist for you. Ordering online can come with unexpected results. Some national floral sites ship your flowers in unarranged, plain cardboard boxes. Bonavista Flowers strives to do better, which is why you can trust us for fresh, hand-arranged flowers that are personally delivered to your recipients throughout Calgary or anywhere nationwide. Don't take the risk – trust Bonavista Flowers. Bonavista Flowers in Calgary, AB provides flower delivery service to the following areas and zip codes in Alberta: Bears Paw, Calgary and Springbank. T2K 3M8, T2V 4H8, T2E 4M5, T2Z 0Z8, T3B 0M8, T1S 5J4, T3A 5M5, T2H 2W2, T2A 4H6, T2K 3Y7, T2K 0E9, T3H 0T1, T3B 5A2, T3H 3P9, T2A 2E3, T3A 0S9, T2E 1L7, T2T 1V1, T2V 1K1, T2L 0B2, T1Y 2V2, T2G 0J8, T2X 0J2, T2M 1Y1, T2V 4C4, T2J 1C3, T2J 1M9, T2Z 4B5, T2T 1J4, T2J 4K8, T3L 1S6, T2S 1K2, T2T 2V1, T2X 1K2, T3E 2N1, T1Y 6T8, T2N 4G5, T2A 1X9, T3B 1Z6, T2P 5P1, T2V 3Y3, T2L 1E1, T2G 3K9, T2E 5H7, T3A 0K9, T2E 5E1, T3Z 2M6, T2Z 4J1, T2P 0J1, T2E 5A6, T3Z 2S7, T2Y 4M1, T1Y 5Z7, T2X 0X2, T2P 5A3, T2H 2E2, T2N 3V7, T2V 3L6, T3A 5P9, T2K 4S6, T3K 1K3, T2G 3W1, T2V 0A1, T2E 8C9, T2J 0L9, T3C 0Z1, T2K 5K1, T2K 3Z6, T3A 1P9, T3R 1J5, T2G 1B4, T2E 4P9, T2E 4S3, T3C 1T1, T2G 1R2, T2E 1J2, T2Y 1W1, T3B 2C8, T2Z 3V9, T3R 1S2, T2X 3X7, T3Z 2G4, T3E 6A4, T2B 2P5, T3B 1Y7, T3H 1X6, T3K 0A8, T2H 0X4, T3H 0B7, T3A 6K6, T2A 0X4, T2V 4L7, T3G 1Z2, T2B 1C6, T2P 5N5, T2A 1R6, T3K 1N7, T2K 4Y7, T2P 0E7, T3E 3N4, T2J 0N6, T2J 0N6, T2J 0N7, T2J 0N8, T2J 3M3, T2J 0P1, T2J 0N9, T2J 0P1, T2J 3S9, T2J 0P2, T2J 0P3, T2J 2X8, T2J 3G9, T2J 3T1, T2J 3H1, T2J 2X9, T2J3B4, T2J 3B4, T2J 3B5, T2J 3B6, T2J 2W7, T2J 3A9, T2J 2Z7, T2J 2Z8, T2J 4B5, T2J 3M4, T2J 3Z6, T2J 2Z9, T2J 3A1, T2J 3A1, T2J 3A2, T2J 3M5, T2J 2Y6, T2J 3M6, T2J 3M7, T2J 3M8, T2J 3M9, T2J 3N1, T2J 0M2, T2J 0M1, T2J 0M3, T2J 0M4, T2J 0M6, T2J 0M5, T2J 0M8, T2J 0M7, T2J 0M9, T2J 0N1, T2J 0N2, T2J 0N3, T2J 0N4, T2J 2M8, T2J 0N5, T2J 4K4, T2J 3Y6, T2J 3X6, T2J 4K6, T2J 4K5, T2J 3X6, T2J 6X3, T2J 3X4, T2J 3X9, T2J 3Y1, T2J 3Y2, T2J 3X5, T2J 3Y3, T2J 4K3, T2J 4L5, T2J 4L8, T2J 6L5, T2J 6L5, T2J 4X1, T2J 4X2, T2J 4X7, T2J 4X3, T2J 5B6, T2J 4K7, T2J 3Y4, T2J 4K8, T2J 4K9, T2J 3Y5, T2J 4L1, T2J 4L2, T2J 5P7, T2J 5P6, T2J 6S3, T2J 6P9, T2J 6P1, T2J 6L3, T2J 6L4, T2J 6J3, T2J 6B3, T2J 6R1, T2J 6W2, T2J 5Z2, T2J 6C2, T2J 5Z3, T2J 5Z1, T2J 5V2, T2J 5X2, T2J 5M7, T2J 5M8, T2J 5P8, T2J 5P9, T2J 6B8, T2J 5N5, T2J 5R1, T2J 5R2, T2J 5N9, T2J 5R3, T2J 0E1, T2J 0E2, T2J 0E3, T2J 0E4, T2J 2V9, T2J 4C6, T2J 3B1, T2J 5B1, T2J 5C4, T2J 3B2, T2J 3B3, T2J 3X8, T2J 0A5, T2J 0A6, T2J 0A7, T2J 0A8, T2J 0A9, T2J 0B1, T2J 0B2, T2J 0B3, T2J 0B4, T2J 0B5, T2J 0B6, T2J 0B7, T2J 0B8, T2J 0B9, T2J 2Y1, T2J 0C1, T2J 0C3, T2J 0C5, T2J 0C6, T2J 0C7, T2J 0C8, T2J 7G2, T2J 0C9, T2W 5V3, T2W 5Z4, T2J 6G2, T2J 6X5, T2J 7H1, T2J 6S2, T2J 7C6, T2J 7C3, T2W 5V9, T2W 2S6, T2J 4G8, T2J 4E4, T2J 3R7, T2J 3R9, T2J 4E3, T2J 5J4, T2J 3S2, T2J 4C9, T2J 3R3, T2J 4E2, T2J 3S1, T2J 4E5, T2J 4E1, T2J 3R8, T2J 3S3, T2J 3R4, T2J 3S4, T2J 4T2, T2J 3S6, T2J 3R5,T2J 3R6, T2J 4G5, T2J 3S5, T2J 4P8, T2J 5C9, T2J 4G9, T2J 4G6, T2J 4P9, T2J 4T3, T2J 4P6, T2J 4P7, T2J 4G4, T2J 4G7, T2J 4S8, T2J 6R6, T2J 4S9, T2J 4T1, T2J 5G4, T2J 6J4, T2J 6E6, T2J 5E5, T2J 6N2,T2J 6N4, T2J 6X1, T2J 6G8, T2J 6S7, T2J 5J9, T2J 5K1, T2J 5R5, T2J 5R4, T2J 5V9, T2J 5W1, T2J 5W8, T2J 6Z3, T2J 6X7, T2J 6Y3, T2J 5Y4, T2J 6A8, T2J 6B5, T2J 6N2, T2J 6A9, T2J 7G1, T2J 7C4, T2J 5Y8, T2J 6X6, T2J 6Y4, T2J 6X8, T2J 7C2, T2J 5X9, T2J 5Y6, T2J 5Y7, T2J 5Y5, T2C 5E7, T2C 3G3, T2C 5E1, T2C 5E3, T2C 3E7, T2Z 2T6, T2Z 3E7, T2Z 2J1, T2Z 3E7, T2Z 2H3, T2Z 1L1, T2Z 1M4, T2Z 2PS, T2Z 2T5, T2Z 2T7, T2Z 2T6, T2Z 2H2, T2Z 2H4, T2Z 2J2, T2Z 2J3, T2Z 2J1, T2Z 2P2, T2Z, 2P1, T2Z 2H5, T2Z 1Y4, T2Z 1Y1, T2Z 1L1, T2Z 1M4, T2Z 1L7, T2Z 2G7, T2Z 1N4, T2Z 2H2, T2Z 2T7, T2Z 2T5, T2Z 1M4, T2Z 2P2, T2Z 2H4, T2Z 2P1, T2Z 1L7, T2Z 1Y1, T2Z 2P1, T2Z 3P4, T2Z 2T5, T2Z 1Y4, T2Z 2J2, T2Z 1Y4, T2Z 2T6, T2Z 2J2, T2Z 2J3, T2Z 2T5, T3M 0A3, TM3 0E3, T3M 0M4, T3M 0A7, T3M 0A4, T3M 0K4, T3M ON4, T3M 0E9, T3M 0V2, T3M 0M5, T3M 0A9, T3M 0A6, T3M 0M5, T3M 0A6, T3M 0A5, T3M 0E8, T3M 0A8, T3M 0E8, T3M 0M3, T3M 0K7, T3M 0A4, T3M 0A5, T3M 0A7, T3M 0A6, T3M 0V7, T3M 0C5, T3M 0C6, T3M 0A3, T3M 0M4, T3M 0A3, T3M 0K3, T3M 0M6, T3M 1K8, T3M 0C6, T3M 0C8, T3M 0K6, T3M 0E4, T3M 0E3, T3M 0A9, T3M 0K4, T3M 0A8, T3M 1K8, T3M 0A9, T3M 1K8, T3M 0R2, T3M 0K3, T3M 0K3, T3M 0M7, T3M 0A5, T3M 0E9, T3M 0A5, T3M 1K9, T3M 1K8, T3M 0A8, T3M 0N1, T3M 0M9, T3M 1L1, T3M 0M9, T3M 0N3, T3M 0N2, T3M 0K5, T3M 1K9, T3M 1K8, T3M 0V8, T3M 0K5, T3M 0M3, T3M 0H1, T3M 0H2, T3M 0C5, T3M 1K9, T3M 0H4, T3M 0A4, T3M 0C5, T3M 0C7, T3M 0A9, T3M 0M5, T3M 0H6, T3M 0H7, T3M 0J6, T3M 0C6, T3M OJ6, T3M 0K1, T3M 0E3, T3M 0T9, T3M 0S8, T3M 0S7, T3M 0T8, T3M 0S3, T3M 0W1, T3M 0T9, T3M 0S4, T3M 0T8, T3M 0V9, T3M 0S3, T3M OV5, T3M 0S6, T3M 0S7, T3M OV6, T3M 0S5, T3M 0V5, T3M 1A6, T3M 1A4, T3M 1B5, T3M 1B6, T3M 1C6, T3M 1H7, T3M 1G9, T3M 1K6, T3M 1G9, T3M 1C4, T3M 1B2, T3M 1H7, TT3M 1C4, T3M 1B3, T3M 1K5, T3M 1H9, T3M 1G8, T3M 1A7, T3M 0C4, T3M 1H8, T3M 1K6, T3M 1G8, T3M 1H9, T3M 1C5, T3M 1H8, T3M 1B4, T3M 1C5, T3M 1K7, T3M 1A4, T3M 1K5, T3M 1H8, T3M 1H1, T3M 1B3, T3M 1A5, T3M 1H9, T3M 1A5, T3M 1H3, T3M 1H5, T3M 0E6, T3M 1C9, T3M 1C9, T3M 0A2, T3M 0A1, T3M 1H6, T3M 0G3, T3M 0A1, T3M 0G3, T3M 1C7, T3M 0N6, T3M 1H3, T3M 1G6, T3M 0G4, T3M 0E5, T3M 0N5, T3M 0A2, T3M 1H3, T3M 1G5, T3M 0G2, T3M 0A1, T3M 1H3, T3M 0E5, T3M 1H6, T3M 1C9, T3M 0A2, T3M 1G5, T3M 1J2, T3M 1G6, T3M 0A2, T3M 1E1, T3M 1J3, T3M 1H5, T3M 1H4, T3M 1G7, T3M 1J3, T3M 1H6, T3M 0E5, T3M 1C7, T3M 1G6, T3M 0E6, T3M 1G7, T3M 0G2, T3M 1J7, T3M 1C7, T3M 0G2, T3M 1A8, T3M 1E9, T3M 1A4, T3M 1A7, T3M 1A5, T3M 1G1, T3M 1E7, T3M 1A1, T3M 0W1, T3M 1E8, T3M 0J5, T3M 1E7, T3M 0J4, T3M 1G8, T3M 1K5, T3M 0K1, T3M 0G4, T3M 1K6, T3M 0S9, T3M 0C2, T3M 0C1, T3M 1E8, T3M 0C3, T3M 0J2, T3M 0J4, T3M 0L5, T3M 1A3, T3M 1A1, T3M 0B6, T3M 0B3, T3M 1L5, T3M 1K1, T3M 1J4, T3M 1A2, T3M 1J4, T3M 1C3, T3M 1A7, T3H 2A2, T3H 3K4, T3H 1E3, T3H 1B3, T3H 1B4, T3H 1B8, T3H 1A1, T3H 1B5, T3H 1B6, T3H 1B7, T3H 4B8, T3H 3T9, T3H 1B9, T3H 1E4, T3H 3R7, T3H 1C8, T3H 2S3, T3H 2R4, T3H 2R2, T3H 2S3, T3H 2S2, T3H 2S4, T3H 2S5, T2X 0M4, T2X 0L9, T2X 0M4, T2X 0L8, T2X 0L9, T2X 0M2, T2X 0M3, T2X 0L8, T2X 0M3, T2X 0M4, T2X 0M1, T2W 2K5, T2W 2A8, T2W 2G8, T2W 2G3, T2W 2E9, T2W 6A6. T2W 4B3, T2W 3P7, T2W 5W9, T2W 3X1, T2W 2A6, T2W 5N1, T2W 2A7, T2W 6G3, T2W 2S8, T2W 1P3, T2W 1H3, T2W 6B9, T2W 2G1, T2W 3P5, T2W 3G4, T2W 3M7, T2W 6C1, T2W 2B7, T2W 2S9, T2W 1P4, T2W 1H4, T2W 6C2, T2W 3S7, T2W 6C3, T2W 6B9, T2W 1H7, T2W 1H8, T2W 1J1, T2W 1H9, T2W 1J2, T2W 3S8, T2W 2B6, T2W 2B6, T2W 2G2, T2W 1R2, T2W 6C3, T2W 2A1, T2W 1T3, T2W, 5A3, T2W 2K3, T3H 2AA2, T3H 3K4, T3H 1E3, T3H 1B3, T3H 1B4, T3H 1B8, T3H 1A1, T3H 1B5, T3H 1A2, T3H 4B6, T3H 3T9, T3H 1B9, T3H 1E4, T3H 3R7, T3H 1C8, T2Z 0K8, T2Z 0V4, T2Z 4X7, T2Z 0G6, T2Z 0R7, T2Z 0L1, T2Z 0E7, T2Z 4X8, T2Z 0K9, T2Z 0P5, T2Z 0P3, T2Z 0L1, T2Z 0G8, T2Z 0R6, T2Z 0P2, T2Z 0R8, T2Z 0P1, T2Z 0J3, T2Z 0G7, T2Z 0E7, T2Z 0G7, T2Z 0J3, T2Z 4X7, T2Z 0R8, T2Z 0G6, T2Z 0L3, T2Z 0K8, T2Z 0P1, T2Z 0P5, T2Z 0R8, T2Z 0P6, T2Z 4X9, T2Z 4S2, T2Z 0G6, T2Z 0G5, T2Z 0R6, T2Z 0P1, T2Z 0J2, T2Z 0L5, T2Z 0L3, T2Z 0P3, T2Z 0J3, T2Z 0P3, T2Z G5, T2Z 0G5, T2Z 0P4, T2Z 4V4, T2Z 0G5, T2Z 0E7, T2Z 0R7, T2Z 0J5, T2Z 4S1, T2Z 0K9, T3M 0B1, T3M 0B8, T3M 0B9, T3M 1G4, T3M 1E8, T3M 0B9, T3M 0B1, T3M 1E9, T3M 1A9, T3M 0C2, T3M 1G1 T3M 0J4, T3M 0B2, T3M 1G2, T3M 0B2, T3M 1G3, T3M 0B9, T3M 1A9, T3M 0B2, T3M 1E9, T3M 1G3, T3M 1G4, T3M 0B7, T3M 0B8, T3M 1A2, T3M 1G1, T3M 1A9, T3M 0B8, T3M 1G3, T3M 0B8, T3M 1G2, T3M 1B1, T3M 0B7, T3M 1G3, T3M 1G2, T3M 0J5, T3M 0J5, T3M 0B1. T3M 0L9, T3M 0N8, T3M 1J6, T3M 1L3, T3M 0B3, T3M 0B5, T3M 1K3, T3M 0N8, T3M 1L3, T3M 1K3, T3M 0L5, T3M 0L8, T3M 0B4, T3M 0G7, T3M 0B5, T3M 1J4, T3M 0G7, T3M 0S1, T3M 1K1, T3M 0B3, T3M 0S2, T3M 0B6, T3M 1J4, T3M 0L8, T3M 0N7, 1K2, T3M 0L8, T3M 1J5, T3M 0L9, T3M 0M1, T3M 1K4, T3M 0G9, T3M 1L5, T3M 0L6, T3M 0L6, T3M 0B4, T3M 0N8, T3M 0W2, T3M 0W3, T3M 0W1, T3M 0V9, T3M 0V1, T3M 0W1, T3M 0W2, T3M 0E7, T3M 0C1, T3M 0J3, T3M 0J1, T3M 0J2, T3M 0H9, T3M 0E7, T3M 0C3, T3M 1H3, T3M 1H5, T3M 0E6, T3M 0N5, T3M 1H5, T3M 1C9, T3M 0A2, T3M 1H6, T32M 0G3, T3M 1H3, T3M 1C7, T3M 0N6, T3M 1G6, T3M 0G4, T3M 0E5, T3M 1H4, T3M 1H5, T3M 1J1, T3M 1E1, T3M 0A1, T3M 1H6, T3M 1J2, T3M 0A2, T3M 0E5, T3M T3M 1J3, T3M 1G7, T3M 1G5, T3M 0E6, T3M 1H4, T3M 1J3, T3M 0E5, T3M 1C7, T3M 1G6, T3M 0G2, T3M 1C8, T3M 0E6, T3M 1J7, T3M 1C7, T3M 0G2, T3M 0T9, T3M 0S8,L T3M 0S7, T3M 0T8, T3M 0S3, T3M 0W1, T3M 0T9, T3M 0S4, T3M 0T8, T3M 0V9, T3M 0S7, T3M 0S6, T3M 0S5, T3M 0V5, T2C 2L3, T2C 0C4, T2C 0C6, T2C 0C5, T2C 1J2, T2C 0C7, T2C 0E1, T2C 0C9, T3H 4X3, T3H 4X6, T3H 4X4, T3H 5R7, T3H 5C4, T2X 0A8, T2X 3P3, T2X 0A7, T2X 0L7, T2Z 0B2, T2X 3X3, T2X 3P1, T2X 0B1, T2X 3W3, T2X 3Y3, T2X 0L5, T2X 0J4, T2X 0X1, T2X 3P2, T2X 3P4, T2X 3Y5, T2X 3P4, T2X 3P1, T2X 3R8, T2X 0A8, T2X 3R3, T3X 0J4, T2X 3P1, T2X 0A9, T2X 0L5, T2X 3W4, T2X 3X1, T2X 3V6, T2X 3X2, T2X 3X4, T2X 3P3, T2X 3X5, T2X 0L6, T2X 3Y4, T3E 7C9, T3E 7P7, T3E 6K6, T3E 0A3, T2E 1P6, T2W 1P7, T2W 1P8, T2W 1P5, T2L 0S3, T2L 0S2, T3Z 1H4, T1Y 6S8, T1Y 6S9, T1Y 6T1, T1Y 6X5, T1Y 6X6, T1Y 6S7, T1Y 6V4, T1Y 6W1, T1Y 6T1, T1Y 6X5, T1Y 6Y8, T1Y 6R2, T2W 1N7, T2W 1N6, T2W 1N3, T2W 1N4, T2W 1N5, T2W 1L1, T2W 1K9, T2W 1K4, T2W 1K5, T2W 1K7, T2W 1K3, T2W 1K6, T2W 1J9, T2W 1K2, T2W 1J9, T2W 1J8, T2W 1V3, T2W 1V2, T2W 1J7, T2W 1V1, T2W 1V5, T2W 1J6, T2W 1T7, T2W 1T6, T2W 1T5, T2W 1T4, T2W 2L7, T2W 2L8, T2W 2L9, T2W V2L, T2W 2L8, T2W 2L9, T2W 1M8, T2W 1M7, T2W 1M6, T2W 1M5, T2W 1M3, T2W 1M4, T2W 1L8, T2W 1L9, T2W 1M1, T2W 6G4, T2W 1L7, T2W 1M2, T2W 2K2, T2W 2L6, T2W 2L3, T2W 2L5, T2W 2M7, T2L 0R2, T2L 0R3, T2L 0Z9, T2L 0G9, T2L 0H3, T2L 0H4, T2L 0H5, T2L 0H6, T2L 0H1, T2L 0H7, T2L 0H8, T2L 0H9, T2L 0J1, T2L 0J2, T2L 0J3, T2L 0J4, T2L 0J5, T2L 1B2, T2L 0J7, T2L 0J8, T2L 0H2, T2L 0S6, T2T 3K3, T2T 3K4, T2T 3K5, T2T 3K7, T2T 3K6, T2T 3K8, T2T 3L1, T2T 3L2, T2T 3L3, T2T 5Y6, T2T 3L5, T2L 0S8, T2K 1W5, T2K 1W4, T2L 0K5, T2L 0K7, T2Z 3L8, T2M 4K1, T2M 4K2, T2M 4K5, T2M 4K6, T3J 1S5, T3J 1M3, T3J 1K7, T3J 1L5, T3J 1M4, T3J 1S9, T3J 1K9, T3J 1K8, T3J 1M7, T3J 1M6, T3J 1M5, T3J 1L2, T3J 1L4, T3J 1M9, T3J 1L3, T3J 1V1, T3J 1L1, T3J 1M8, T3J 1M7, T3J 1M6, T3J 1M5, T3J 1L2, T3J 1L3, T3J 1V1, T3J 1N1, T3J 1M8, T3J 1Y6, T3J 1Y6, T3J 1R9, T3J 1S1, T3J 1R7, T3J 1R8, T2L 0M8, T2L 0M9, T2L 0N1, T2L 0N2, T2L 0N3, T2L 0N4, T2L 0N5, T2L 0N7, T2L 0N6, T2W 2B4, T2W 1X8, T2W 1X4, T2W 1X6, T2W 1X5, T2W 2B2, T2W 2B3, T2W 1X7, T2W 1Y3, T2W 1Y4, T2W 1X9, T2W 1Y1, T2W 3S9, T2W 1Y2, T2W 3G5, T2W 2N9, T2W 6H4, T2W 6H5, T2E 7W6, T2E 9C4, T2E 2P8, T2E 0A3, T2E 2P9, T2E 0A2, T2P 2R1, T2E 0A4, T2E 0A4, T2E 2R2, T2E 7K6, T2E 2R3, T2E 5A5, T2E 0A5, T2E 2R4, T2E 2R6, T2E 2R5, T2E 2E2, T2E 2E3, T2E 2R9, T2E 2R9, T2E 2R8, T2E 2E4, T2E 2E5, T2E 2S1, T2E 2E6, T2E 2S2, T2E 8S7, T2E 8K2, T2E 7Y2, T2E 8A4, T2E 2S4, T2E 2S3, T2E 5N8, T2E 2S5, T2E 0A6, T2E 6L3, T2E 2S8, T2E 0A8, T2E 0A7, T2E 2S9, T2E 2T1, T2E 2B7, T2E 0A9, T2G 2B6, T2E 0A9, T2G 2B6, T2E 2T2, T2E 2T3, T2E 2T5, T2E 8N1, T2E 2T7, T2E 2T8, T2E 2T9, T2E 2V, T2A 2L1, T2A 2L2, T2E 2V2, T2E 2V3, T2E 2V4, T2A 2L3, T2E 2V6, T2E 2V5, T2E 2L5, T2A 2L4, T2E 2V7, T2E 2V8, T2E 2V9, T2A 4Y2, T2A 4Y2, T2E 2X2, T2G 2B9, T2G 2B8, T2E 2X4, T2E 2X5, T2E 2X6, T2G 4X6, T2E 2X8, T2E 2X7, T2E 2X9, T2E 2Y1, T2E 2Y2, T2E 2Y4, T2E 2Y5, T2E 2Y6, T2E 2Y7, T2G 2C2, T2E 2Y8, T2E 2Y9, T2E 2Z1, T2E 2Z2, T2E 2Z3, T2E 2Z5, T2E 2Z6, T2E 2Z7, T2G 5A4, T2K 0S9, T2K 0S8, T2G 2C4, T2K 0V5, T2K 0T1, T2K 0T3, T2K 0T4, T2H 0C2, T2K 0T6, T2H 0C1, T2H 0C3, T2K 0V1, T2H 0C4, T2K 0T8, T2K 0T9, T2H 0C7, T2H 0C6, T2K 0V2, T2K 0V3, T2G 2C7, T2K 0V4, T2K 5C5, T2K 4Y5, T2K 5C4, T2G 5P6, T2K 6C1, T2E 5J2, T2E 8K1, T3K 2X4, T3K 1J7, T2E 9C3, T3K 1J5, T3K 1Y1, T3K 1J6, T2E 2P6, T2E 2P7, T2E 9C7, T2E 9C8, T2E 0P3, T2E 2M9, T2E 7W7, T2E 9C4, T2E 0A3, T2E 2P9, T2E 0A2, T2E 2R1, T2E 7K6, T2E 2R3, T2G 5A5, T2E 0A5, T2E 2R5, T2E 2R6, T2E 2R7, T2G 2E2, T2G 2E5, T2E 2S1, T2G 2E6, T2E 8K2, T2E 7Y2, T2E 8A4, T2E 2S3, T2E 0A6, T2E 2S6, T2E 6L3, T2E 2S9, T2E 2T1, T2G 2B7, T2E 2T3, T2E 2T4, T2E 2T5, T2E 2T9, T2E 2V1, T2A 2L1, T2A 2L2, T2E 2V2, T2E 2V3, T2A 2V6, T2E 2V6, T2E 2V5, T2A 2L4, T2A 7P5, T2E 2X1, T2E 2V9, T2A 4Y2, T2E 2X2, T2G 2B8, T2G 2B9, T2E 3X3, T2E 2X4, T2E 2X5, T2E 2X6, T2G 4X6, T2E 2X7, T2E 2X9, T2E 2Y1, T2E 2Y2, T2E 2Y3, T2E 2Y3, T2E 2Y4, T2E 2Y5, T2E 2Y6, T2E 2Y7, T2G 2C2, T2E 2Y8, T2E 2Y9, T2E 2Z1, T2E 2Z2, T2E 2Z3, T2E 2Z4, T2E 2Z5, T2E 2Z5, T2E 2Z7, T2G 5A4, T2K 0S9, T2K 0S8, T2G 2C4, T2K 0T2, T2K 0V5, T2K 0T4, T2H 0C2, T2K 0T5, T2K 0T6, T2H 0C1, T2H 0C3, T2H 0T7, T2H 0C5, T2H 0C4, T2H 0C7, T2K 0T8, T2K 0T9, T2H 0C6, T2G 2C7, T2K 2C7, T2K 0V4, T2K 5C5, T2K 4T5, T2G 5P6, T2K 6C1, T2E 8K1, T2G 5J2, T2E 9C3, T3K 1J5, T3K 1B8, T3K 1J6, T2G 1B8, T2E 2P6, T2E 9C7, T2E 9C8, T2E 0P3, T2E 2M9, T2M 2R4, T2M 2R5, T2K 0V6, T2K 0V7, T2K 0V9, T2K 0V8, T2K 0W1, T2K 0W2, T2K 0W3, T3R 1B7, T2K 1Y1, T2K 1Y2, T2K 1Y3, T3H 4N5, T3H 4N6, T3H 4Y6, T3H 4N5, T3H 4N7, T3H 4Y6, T3H 5H3, T3H 5A5, T3H 5A6, T3H 5A7, T3H 4Y1, T3H 4R1, T3H 5H7, T3H 5L9, T3H 4P9, T3H 5X2, T3H 5T6, T3H 5G4, T3H 4P9, T3H 4Y3, T3H 5G3, T3H 4R3, T3H 4Y4, T3H 5T8, T3H 5T1, T3H 4Y2, T3H 4P8, T3H 5L6, T3H 5X4, T3H 5T7, T3H 5T6, T3H 5G2, T3H 5L9, T3H 4Y4, T3H 5L6, T3H 4R2, T3H 5L8, T3H 4R3, T3H 5G3, T3H 5S9, T3H 5S8, T3H 4Y3, T3H 5T1, T3H 5L7, T3H 5L6, T3H 5H7, T3H 4P8, T3H 4R3, T3H 4Y3, T3H 5H6, T3H 5X5, T3H 5S8, T3H 5T6, T2X 3S8, T2S 3T9, T2X 3T9, T2X 3R9, T2X 3T3, T2X 3T6, T2X 3T8, T2X 3T6, T2X 3S8, T2X 3R1, T3X 3R9, T2X 3R1, T2X 3S5, T2X 3V7, T2X 3V7, T2X 3R2, T2X 3T3, T2X 3R2, T2X 0E7, T2X 3R2, T2L 0T2, T2L 0T3, T2L 0T4, T2L 0T5, T2L 0T7, T2M 4L1, T2L 2C3, T2L 2C1, T2L 2C4, T2L 2C5, T2L 2C6, T2L 2C7, T2L 2C8, T2L 2C9. T2L 2E1, T2L 2E2, T2L 2E3, T2L 2E4, T2L 2E5, T2L 2E6, T2L 0Z4, T2L 0Z5, T2L 0Z6, T2L 0M3, T2L 0M4, T2V 2P3, T2V 2P4, T2V 2P5, T2V 2P1, T2V 2N9, T2V 2P2, T2R 1C9, T3C 2V5, T3C 2Y4, T2L 0Z3, T2L 0Z2, T2L 0X1, T2L 0X2. T2V 2P6, T2V 2P7, T2V 2P9, T2V 2P8, T2L 0W6, T2L 0W7, T2L 0W8, T2L 0W9, T2L 0Y9, T2L 0Z1, T3H 2R8, T3H 2V2, T3H 2S1, T3H 2R9, T3H 2S1, T3H 2R7, T3H 2R5, T3H 2R5, T3H 2R6, T3H 2R9, T3H 2R5, T3H 2V2, T3H 2R7, T3R 1B1, T3R 1B2, T3R 1C1, T2Z 2T4, T3Z 2T5, T3G 5C9, T3G 5A7, T3G 5A8, T3G 5A6, T3G 5A8, T3G 4G2, T3G 4K5, T3G 4W4, T3G 4N1, T3G 4G4, T3G 4W3, T3G 4K4, T3G 4G2, T3G 4K5, T3G 4W2, T3G 4K4, T3G 4G3, T3G 4G2, T3G 5A6, T3G 4W8, T3G 5A5, T3G 5A6, T3G 5N6, T3G 5N5, T3G 4A5, T3G 4Y9, T3G 4Z5, T3G 4K6, T3G 5N6, T3G 4K9, T3G 4Z4, T3G 4V9, T3G 4K7, T3G 4Z3, T3G 4T3, T3G 4Z2, T3G 5N6, T3G 4V9, T3G 5N4, T3G 4Z1, T3G 4K7, T3G 4V9, T3G 4K8, T3G 5N3, T3G 3V2, T3G 3V1, T3G 3V3, T3G 4P8, T3G 4V5, T3G 4V4, T3G 4P8, T3G 4V6, T3G 4V6, T3G 4P9, T2L 0P1, T2L 0P3, T2L 0P4, T2L 0P2, T2V 2R7, T2Z 3J9, T2S 0Z3, T2S 0Z4, T3H 4P7, T3H 2A1, T3H 1G2, T3H 1Z6, T3H 1L7, T3H 1Z7, T3H 1C9, T3H 1E2, T3H 1C3, T3H 1C5, T3H 1C4, T3H 2T3, T3H 1L6, T3H 2T3, T3H 1C7, T3H 2T3, T3H 1A7, T3H 1A6, T3H 1A3, T3H 1A4, T3H 1A5, T3H 1C2, T3H 1C1, T3H 1E7, T3H 1E8, T3H 1E1, T2L 0T1, T2L 0S9, T3E 7P3, T3E 7P5, T3E 7S8, T3E 7P2, T3E 7P4, T2K 1W3, T2K 1W3., T3E 7H8, T3E 7L9, T2V 2R1, T2V 2R2, T2T 6J5, T2T 6K2, T2K 1P8, T2K 1R1, T2K 1P9, T2K 1R2, T2K 1P7, T2K 1R3, T3L 2P5, T2W 5R7, T2W 3B3, T2W 3B2, T2W 5R8, T2W 5R9, T2W 6B6, T2W 6B5, T2W 3B2, T2W 3B3, T2W 6G7, T2W 1P2, T2W 1P1, T2W 1N8, T2W 1N9, T2W 1N1, T2W 1M9, T2W 1N2, T2W 0H5, T2W 1T8, T2W 1T9, T2W 1Z6, T2W 2B8, T2W 1Z8, T2W 1Z7, T2W 1Z9, T2W 3G1, T2W 3G2, T2L 1C5, T2L 1C6, T2W 5M9, T2W 3Z2, T2W 3Z3, T2W 3X9, T2W 4R2, T2W 4R3, T2W 4M1, T2W 3X2, T2W 3Z9, T2W 4R1, T2W 1X2, T2W 2M6, T2W 2M5, T2W 2K6, T2W 1X3, T2W 2A3, T2W 2C5, T2W 2C5, T2W 2A3, T2W 2C7, T2W 2E4 T2W 2T2, T2W 2C2, T2W 2K7, T2W 2A4, T2W 2K8, T2W 2K9, T2W 1W7, T2W 2A2, T2W 2E5, T2W 1W8, T2W 1W9, T2W 1K8, T2W 1X1, T2W 2C4, T2W 2C3, T2M 4B9, T2M 4C1, T2M 4C2, T2M 4C3, T2M 4C4, T2M 4C5, T2M 4C6, T2M 2R2, T2M 2R1, T2K 1S1, T2K 1R9, T2K 1R5, T2K 1S2, T2K 1S3, T2K 1R6, T2K 1R7, T2K 1R8, T2L 0S4, T2L 0S5, T2V 2T8, T2V 2T9, T2V 2V2, T2V 2V1, T1Y 6Z4, T1Y 6Z3, T1Y 6Y4, T1Y 6Z3, T1Y 6Y4, T1Y 6Z3, T1Y 6Y4, T2L 1E6, T2L 1E7, T2L 1E8, T2L 1G1, T2L 1G2, T2L 1G3, T2L 1G4, T2L 1B1, T2T 3J5, T3B 2V6, T3J 2J4, T3J 1S8, T3J 1R3, T3J 1Y3, T3J 1R2, T3J 2C5, T3J 2C5, T3J 2B1, T3J 1V7, T3J 2C4, T3J 1S3, T3J 1M1, T3J 2M1, T3J 1X1, T3J 2A7, T3J 2A1, T3J 1M2, T3J 1R5, T3J 1T2, T3J 1T2, T3J 1R1, T3J 1V5, T3J 1V8, T3J 1P1, T3J 1Y2, T3J 1X4, T2J 1X9, T3J 1Y4, T3J 1Z7, T3J 1X7, T3J 1X5, T3J 1X6, T3J 2A2, T3J 2A4, T3J 1P2, T3J 3B9, T3J 1V6, T3J 1S6, T3J 1S4, T3J 1N4, T3J 2B8, T3J 1T3, T3J 2G4, T3J 1V2, T3J 1N2, T3J 1N3, T3J 1Y5, T3J 1T1, T3J 1P8, T3J 1Z8, T3J 1Y8, T3J 3J8, T3J 1V4, T3J 2M2, T3J 1X3, T3J 2A3, T3J 1P3, T3J 1P6, T3J 2A5, T3J 1N6, T3J 3C4, T3J 1N7, T3J 1N9, T3J 1Y9, T3J 1Y9, T3J 1Y7, T3J 1P9, T3J 1Z1,T3J 2B7, T3G 5E2, T3G 5E1, T3G 5E3, T3G 5E5, T3G 4S6, T3G 4S4, T3G 5E5, T3G 5E4, T3G 5M8, T3G 5E6, T3G 5E6, T3G 4S5, T3G 4S6, T3G 5E6, T3G 5M7, T3G 3V5, T3G 3V6, T3G 3T5, T3G 3V7, T3G 3X1, T3G 3V4, T3G 3V5, T3G 3X1, T3G 3V4, T3G 3T5, T3G 3X1, T3G 3T6, T3G 3T5, T3G 5K9, T3G 5K8, T3G 5L1, T3G 4H7, T3G 4E8, T3G 4E9, T3G 4E8, T3G 4H6, T3H 1A9, T3H 1A8, T3H 1B1, T3H 1J2, T3H 1L8, T3H 1J3, T3H 1L5, T3H 1J4, T3H 1R8, T3H 2A6, T3H 1C6, T3H 1Z8, T3H 1Y9, T3H 1X3, T3H 1Z2, T3H 1Y5, T3H 1H9, T3H 1E9, T3H 1G1, T3H 1H8, T3H 1J1, T3H 1J6, T3H 1J5, T3H 1V9, T3H 1E5, T3H 2V9, T3H 1V8, T3H 1B2, T3H 1E6, T2T 0R1, T2T 0P9, T2T 0R2, T2T 5X5, T2T 0R3, T2T 0R4, T2K 1X6, T2K 1X7, T2K 1X1, T2K 1W9, T2K 1X8, T2K 1X2, T2K 1X3, T2K 1X5, T2K 1W8, T2V 2R3, T2V 2R5, T2V 2R6, T2V 2R4, T2V 2V3, T2V 2X1, T2E 4Z3, T2L 0N8, T2L 0N9, T3Z 2A7, T3Z 2A5, T3Z 2A6, T2G 0G1, T2L 1B3, T2L 1B4. T2L 1B5, T2L 1B6, T2L 1B8, T2L 1B7, T3Z 2L4, T3J 3Y9, T3J 3Y8, T3J 3Y5, T3 3Y6. T3J 3Y7, T3J 3Y8, T3J 3Y4, T3J 3K5, T3J 3T8, T3J 3J6, T3J 3J7, T3J 3J9, T3J 3T8, T3J 3J5, T3J 3J6, T3J 3J7, T3J 3K2, T3J 3J9, T3K 3J5, T3J 3T7, T2K 1V6, T2K 1V5, T2K 1V7, T2K 0L4, T2K 0L5, T1Y 6N9, T1Y 6P1, T2G 2W1, T3Z 3B7, T2L 1A9, T3H 3G9, T2B 1P5, T2B 1P6, T2B 1P7, T2B 1P8, T2B 1P9, T2B 1R1, T2B 1R2, T2B 1R3, T2B 1R4, T2B 1R5, T3H 0A5, T3H 0A3, T3H 0B1, T3H 0A3, T3H 0B2, T3H 0A5, T3H 0B3, T3H 0A4, T3H 0A2, T2T 1X5, T2T 1X6. T2T 1X8, T2T 1X7, T2T 1X9, T2T 1Y1, T2T 1Y2, T3K 5P4, T3K 5G7, T3K 4W7, T3K 4W8, T3K 4X1, T3K 3Y9, T3K 4Y6, T3K 4X1, T3K 5A6, T3K 4W9, T3K 4S8, T3K 5B6, T3K 5C6, T3K 4W3, T3K 3Z3, T3K 4W8, T3K 5A7, T3K 5A9, T3K 5A8, T3K 4X3, T3K 4W4, T3K 5G2, T3K 5C8, T3K 5C9, T3K 5C6, T3K 3Y9, T3K 4S2, T3K 3Z4, T3K 5A8, T3K 5A6, T3K 5B6, T3K 5G63, T3K 5M6, T3K 5G3, T3K 5C9, T3K 4S5, T3K 4S4, T3K 4W3, T3K 5G4, T3K 5A3, T3K 4W7, T3K 4Z2, T3K 3Z5, T3K 3Y9, T3K 4X3 4Z3, T3K 4X2, T3K 5G7, T3K 3T9, T3K 3Z2, T3K 1A6, T3K 5A4, T3K 4Y4, T3K 4W4, T3K 4S4, T3K 1A7, T3K 5G4, T3K 4W3, T3K 4Y4, T3K 3Z2, T3K 4W6, T3K 5B6, T3K 4S5, T3K 5J6, T3K 5C8, T3K 3Z3, T3K 4S3, T3K 5E1, T3K 5A8, T3K 4Y6, T3K 4W7, T3K 5A7, T3K 4Y6, T3K 5C8, T3K 4S5, T3K 4Y4, T3K 4Y5, T3K 5P3, T3K 5K3, T3K 4Y7, T3K 5H2, T3K 3Z3, T3K 1A8, T3K 5K8, T3K 5H8, T3K 4Y5, T3K 4S2, T3K 5C7, T3K 3Z4, T3K 4W3, T3K 4H4, T3K 1A9, T3K 5C8, T3K 5C7, T3K 5G1, T3K 4S7, T3K 4Y6, T3K 3Z5, T3K 4S3, T3K 4S4, T3K 5K8, T3K 5A7, T3K 3Z2, T3K 4Y6, T3K 4Y6, T3K 3Z5, T3K 4Y6, T3K 5B5, T3K 5T4, T3K 4X2, T3K 5X3, T3K 6B4, T3K 0L7, T3K 5K2, T3K 0E3, T3K 6E4, T3K 6E3, T3K 0A2, T3K 0L6, T3K 0E4, T3K 6E2, T3K 5X5, T3K 0E5, T3K 5Y9, T3K 0E9, T3K 0E6, T3K 5Z3, T3K 5Z2, T3K 5T9, T3K 5X3, T3K 0L7, T3K 5X2, T3K 5K1, T3K 5H1, T3K 0T3, T3K 0E7, T3K 5K1, T3K 5X4, T3K 0G2, T3K 0G1, T3K 0E7, T3K 6E1, T3K 0R2, T3K 0R2, T3K 0L7, T3K 5X4, T3K 0L8, T3K 6E2, T3K 0L8, T3K 0E8, T3K 5X4, T3K 0L1, T3K 0P1, T3K 5X3, T3K 0L8, T3K 6E1, T3K 5J7, T3K 0L5, T3K 0E8, T3K 6E2, T3K 6E1, T3K 5J8, T3K 6E2, T3K 6E1, T3K 0L6, T3K 0B1, T3K 0M8, T3K 0K4, T3K 0B1, T3K 6J7, T3K 6J6, T3K 0E1, T3K 0C8, T3K 0B1, T3K 0B1, T3K 0M8, T3K 0C8, T3K 6J6, T3K 0C8, T3K 6J7, T3K 0C9, T3K 6J5, T3K 6J5, T3K 6J7, T3K 5W4, T3K 5W4, T3K 5S4, T3K 5W6, T3K 5W7, T3K 0B2, T3K 6H4, T3K 6A4, T3K 6E5, T3K 6A2, T3K 5W7, T3K 5W5, T3K 5S6, T3K 6H7, T3K 5W4, T3K 6H5, T3K 5X1, T3K 5W3, T3K 5W8, T3K 5W5, T3K 5W4, T3K 6A3, T3K 5X1, T3K 6A3, T3K 6A4, T3K 6A6, T3K 5W8, T3K 6A6, T3K 0E2, T3K 5S5, T3K 5W5, T3K 0B2, T3K 6A6, T3K 4J7, T3K 4J8, T3K 4J5, T3K 4J6, T3K 4K1, T3K 4J9, T3K 4J8, T3K 4E9, T3K 4E9, T3K 4J9, T3K 4J5D, T3K 4P1, T3K 4S9, T3K 5N8, T3K 5V8, T3K 5E3, T3K 5J5, T3K 5V9, T3K 5V7, T3K 5E2, T3K 5J5, T3K 5N8, T3K 5L4, T3K 5E8, T3K 5E6, T3K 5E4, T3K 5L6, T3K 5V8, T3K 5V7, T3K 5E3, T3K 5L6, T3K 5E3, T3K 5E2, T3K 5W1, T3K 5L5, T3K 5E3, T3K 5L5, T3L 2R2, T3L 2R1, T2V 2S9, T2V 2S8, T3Z 3K8, T2K 1W7, T2K 1W6, T3Z 3B9, T2B 1N9, T2B 1P1, T3Z 3C1, T3R 1A5, T3R 1A5, T3R 1A4, T3Z 1A5, T3H 0E8, T3H 0N5, T3H 0E8, T3H 0E9, T3H 0N6, T3H 0N6, T3H 0G3, T3H 4T2, T3H 4T3, T3H 0G3, T3H 4T2, T3H 5Z7, T3H 5Z6, T3H 0G4, T3H 5J9, T3H 0G4, T3H 5J9, T3H 5Y6, T3H 0H3, T3H 0H4, T3H 5Z1, T3H 5Y7, T3H 5Y5, T3H 5Y8, T3H 0M2, T3H 5Y9, T3H 0M2, T3H 5Y5, T3H 5Z2, T3H 5Y8, T3H 0H4, T3H 0K1, T3H 0H6, T3H 0J9, T3H 0H5, T3H 0H3, T3H 0H3, T3H 0L6, T3H 0M2, T3H 5Y7, T2H 0E3, T3H 0E4, T3H 0E5, T3H 0E6, T3J 0Z6, T2H 1S2, T2H 1S1, T2H 1V8, T2H 1V7, T2H 1R4, T2H 1R3, T2H 1R5, T2J 1A2, T2J 1A3, T2J 0Z1, T2J 0Z2, T2J 0V6, T2J 0V7, T2H 1N9, T2H 1N8, T3Z 3S5, T2 3V1, T2W 6H7, T2W 2Z9, T2W 2T8, T2W 3C4, T2J 0A2.